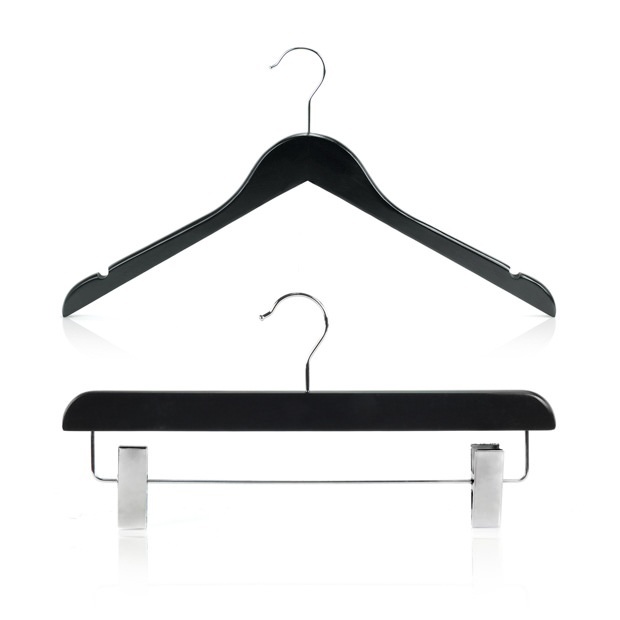 Wardrobe set of top & clip hangers made from maple wood with a sleek, black finish for a stylish appearance. A smooth surface means your clothes won’t get snagged, which causes unsightly loose threads, and quickens the deterioration of your garments. Upper shoulder notches are included on the top hanger which allows you to effortlessly hang clothes that have garment loops and straps, without them sliding off. Straight clip hangers are fully adjustable allowing you to hang garments of varying sizes; the soft rubber lined jaws, not only prevent your clothes from slipping, but will minimise marks and dimples at the place of attachment. Both have a slim, space-saving profile, which reduce wardrobe clutter and free up clothes rail space. Completed with chrome, 360° swivel hooks that enable you to position the hangers in any direction and neatly align your clothes. The top hanger is ideal for hanging shirts, blouses, t-shirts, skirts, dresses, jackets & coats, and the clip hanger is perfect for hanging trousers and skirts. Soft lined jaws on clips. Available in a pack of 15 or 30. Pack of 15 contains 5 clip & 10 top hangers. Pack of 30 contains 10 clip & 20 top hangers. Size Of Top Hanger: Width 45cm (18") approx. Size Of Clip Hanger: Width 36cm (14") approx.